Rescue volunteer Susan Healy, Mama and I had a "girls afternoon out" last Thursday when we visited Dr. Bausone at the Acacia Animal Health Center in Escondido for the first time. Mama had what could only be described as a red carpet reception! We were there for almost 2 hours. Initially, his goal is to reduce her weight from 102 to 75 lbs. Once that objective is attained, he will most likely reduce it further. "She's carrying 60 percent of bulky weight that she doesn't need," he said. Next, we discussed her diet plan. What surprised me is that Dr. B frowns on dry kibble, even the expensive, high quality brands. He wanted to get her on a homecooked diet immediately and provided me with a recipe which I've posted separately. His reasons for advocating a homecooked diet is to ensure that Mama consumes exclusively human-grade food, with no by-products, that is grain-free, low in carbohydrates and high in protein. The problem with most dry food, he says, is that they contain high quantities of grains such as corn, rice and oatmeal -- foods that dogs don't eat in the wild. Cooking for your pet also avoids any danger of unwittingly feeding tainted food that has been responsible for numerous deaths in the past. Dr. B also suggested supplementing her diet with a multivitamin. Regarding an exercise regimen, I explained that Mama only made it halfway around the block the first morning I had her. Since that time her endurance has improved and she has been able to walk the entire route. With that in mind, Dr. B prescribed 2 to 3 one-half hour walks a day as opposed to one long walk. "Push it a little more each day," he advised. Following the consultation, Dr. B left Susan and me in the examination room while he led Mama on a leash down the hall for a blood panel and xrays. 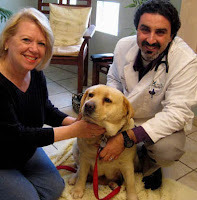 After they returned, we checked out at the front desk where, at his request, we made an appointment for acupuncture next Thurs., June 18 and VOM (veterinary orthopedic manipulation) treatments with Dr. John Harrison beginning Sat. As we exited the building, it was clear that Mama didn't want to leave. 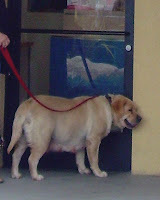 She may be obese, but she has the strength of a bull. Mama led Susan and me around the periphery of the building on her leash, then down a slope and back to the entrance (see photo above) where she gazed through the glass door waiting for someone to open it. Finally, 3 staff members came to our aid by trying to coax her to the parking lot. They were equally unsuccessful. Mama continued to hold her ground until an employee, holding a dog biscuit, lured her to my van.